Alan Hirsch did extremely well with his sessions. Some of the media from our Church Innovation Forum, held earlier this month, is now online. Podcasts, images, etc. – Christoph Schalk’s blog is a good resource. – When i get some time, I will post some video. The idea of “communitas” vs “community” went over well – So often the church doesn’t appeal to men, or it only appeals to men who don’t mind singing sissy songs. Men and women would rather have a dangerous story to belong to. 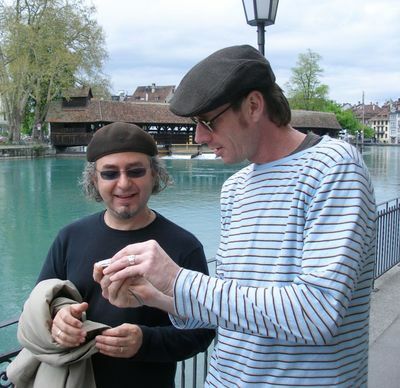 Alan and myself taking a day off in Thun, Switzerland with Reinhold. Related: German speakers should know about David Schafer’s first book on emerging churches in Germany – “The Young Wild Ones” (Die Yungen Wilden). Reinhold has details. hope your wife likes her blackmarket Rolex . . .
Tramadol is a Pain killer abused by many, Huraaa for being a pharmacy student.an effective pain reliever (analgesic). Its mode of action resembles that of narcotics, but it has significantly less potential for abuse and addiction than the narcotics. Tramadol is a Pain killer abused by many, Huraaa for being a pharmacy student.